When I was working in the retail industry part-time selling photo electronics, one of the products I have been asked most about are OtterBoxes. Fortunately, the place I worked at did not carry these cases for a good chunk of time I was there. I am sure you readers have heard about these thick, chunky, and ultimately, horrendous cases that attempt to protect your phone from those accidental drops and bumps. If you have seen APH Networks' video review of the Best Skins Ever Total Body Skin for iPhone 5 and Nexus 4, you also would have heard Editor-in-Chief Jonathan Kwan lament about these "big, fat, and ugly cases", and Otterboxes are exactly that. Of course, not all OtterBox cases are like this, but majority of them are. I would think most phone manufacturers put a great deal of effort to make their devices look as great as they can be without a case. They spend countless man-hours in phone design (Except for Samsung, who spend five minutes of looking in their back mirror for a future design) and users can pay upwards of eight hundred dollars for them, only to be ruined by adding an extra phone's worth of thickness. While these cases may protect devices from small drops and surface scratches, there is a huge compromise to be made in terms of losing the lightweight, slim build. Unfortunately, this a fact of life, and a first world problem. Physically speaking, it is extremely difficult to have protection without adding too much bulk to the mix. However, ADATA might be turning this around with today's review of the DashDrive Durable HD650. This shockproof hard drive is not only covered in three layers, but also sleek and well-designed. 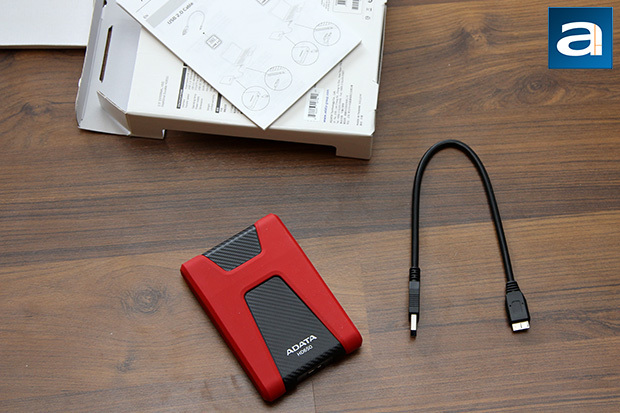 Is this a winner of an external hard drive, or are there too many compromises to be had? Read on to find out! Today's unit of the ADATA DashDrive Durable HD650 500GB arrived with the ADATA PV100 Power Bank I have recently reviewed. Both of these items arrived via UPS Standard from ADATA's American offices in California, USA. 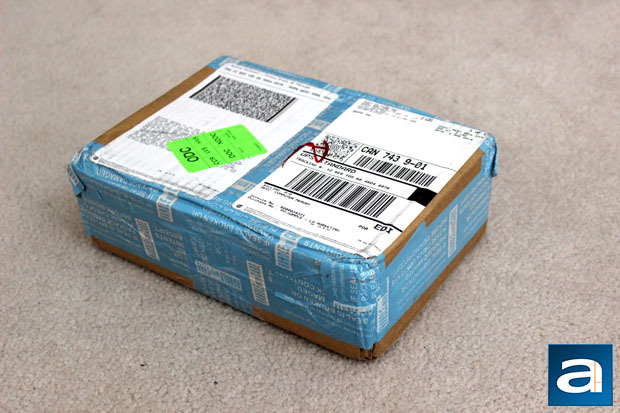 All of the edges are wrapped in a baby blue packing tape to ensure the items inside remain unaltered by anyone except for us here at APH Networks. UPS delivered the brown corrugated cardboard box to us without any issues, as there are no major surface marks on the box. Of course, there are the few bruises in the corners, but this did not affect the internal contents. 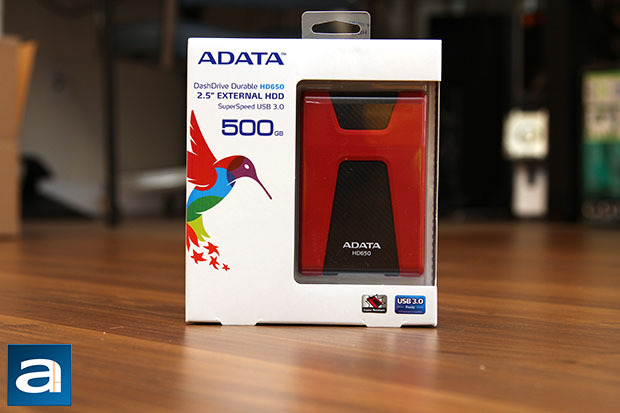 Opening up the box, and we have the retail packing of the ADATA DashDrive Durable HD650 500GB. Like all of their other products, ADATA strays away from the much hated blister pack, and leans to a cardboard box with a plastic tray. This is much appreciated by users and reviewers like myself, as it is relatively easy to remove the product from the box. On the front of the box is the same colorful hummingbird, with a few main features on the front of the box too. Turning to the back, and we get a few more specifications and features, as well as more fine print goodness. The retail box design is good with a simple and clean look, while keeping consistent with other products they currently sell. Popping this retail box open, I pour out all the contents, and this is what we have. Of course, the first thing we see is the ADATA DashDrive Durable HD650 500GB. Two other hard drive capacities of 1TB and 2TB also exist at press time. Next is a male-to-male Micro USB 3.0 to USB 3.0 cable. Last is the quick user guide, which shows users how to use an external hard drive. Of course, the HD650 is about as easy as plug-and-play, but at least this reduces the chance of people plugging the wrong end into the hard drive or the computer. While all of this is nice to know, you readers are probably more interested in the hard drive itself, and so that is where we will head next. posted 3 hours and 50 minutes ago, with 1 posts. posted 3 hours and 50 minutes ago, with 2 posts. posted 3 hours and 51 minutes ago, with 8 posts. posted 3 hours and 51 minutes ago, with 7 posts. posted 3 hours and 55 minutes ago, with 15 posts. posted 3 hours and 55 minutes ago, with 59 posts. posted 3 hours and 55 minutes ago, with 14 posts. posted 3 hours and 56 minutes ago, with 11 posts.